Pets may not have words, but they can communicate. Paying attention to an animal's cues--a joyful bark, a scary growl, a swishing tail--can help a child understand what the animal is "saying" and what an appropriate response might be. That's part of what this book is about. But mostly it's about showing children how to love pets gently--because pets are for loving, after all. Kids learn that teasing isn't nice, that they can choose to be kind to animals, and that if you want to touch someone else's pet, there's one important rule you should know: Ask the owner first! A special section for adults includes ideas for teaching kindness to animals, activities, and discussion starters. "Teaching very young people that pets are living creatures and not toys is of utmost importance. 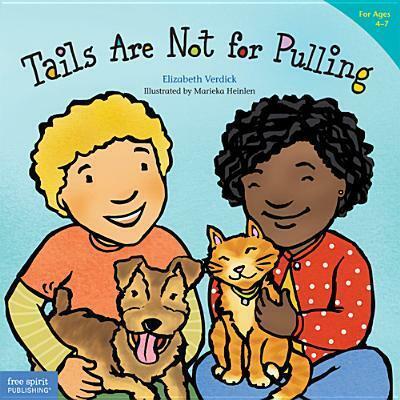 "Tails Are Not for Pulling" is a fun book sure to be enjoyed by parents, their children--and their pets!" --Jack Hanna, Director Emeritus, Columbus Zoo, Host, "Jack Hanna's Animal Adventures"
Marieka Heinlen launched her career as a children's book illustrator with the award-winning "Hands Are Not for Hitting." As a freelance illustrator and designer, Marieka focuses her work on books and other materials for children, teens, parents, and teachers. She lives in St. Paul, Minnesota, with her husband and son.